As we near the end of 2018, it’s time to take a look back at some of favourite creators and titles from the past twelve months. We’re all about championing great work here at the Big Comic Page, and while these picks are clearly just the tip of the iceberg in what has been one heck of a year for comics, we’d highly recommended checking out any (or all) of these if you get the chance. However, we’re also aware that a lot of our contributors have vastly different tastes, so rather than trying to reach some sort of site-wide consensus we have decided instead to give each member of the team a chance to share their own picks, and up next is the turn of Indy, who joined the team back in 2017. Late in the year considering the huge amount of fantastic comics coming from publishers such as Dynamite, Image and IDW, to name but a few, but a well deserved favourite in my humble opinion. For something that had such high stakes for such a huge fan base (many of whom owe those early issues for getting them into comics in the first place), the relaunch of Vertigo’s Sandman Universe has been consistently brilliant with every issue I’ve read. So much thought and detailed planning has clearly gone into every single release over the last few months in what has been a massive team effort spanning multiple series’. Each of the titles released has its own unique set of notes to hit, but have somehow managed to do their original series’ and fans justice while still offering something fresh and interesting for new readers. From the first issue of Sandman Universe and across the beautiful Dreaming, hauntingly stunning Lucifer and the gothic coming-of-age story The Books of Magic, a huge web has been cast over the vertigo universe, with Mr Gaiman himself at the centre acting as the older Morpheus of Endless, presiding over his band of new talented writers and artists as they take this story into the next generation. This was a toughie, and it would end in a draw if I wasn’t dead set on getting you guys to read this book! Dan Watters stands out for me this year by rising to the challenge and bringing Lucifer once again back from the depths of hell. His story is one part mystery, one part existential epistemological philosophy lesson, two parts classical character study of Lucifer and a hell of a sprinkling of nostalgic intrigue. Out of all the comics I’ve read this year Lucifer has been the one I’ve been the most fascinated with; a perfect balancing act of fan service and fresh ideas, breathing new life into a character I’d thought I’d seen the last of after the enjoyable but ultimately disappointing emergence a few years ago. To not only bring Lucifer back but to do so in such a new and exciting predicament that these last few issues have done is an absolutely amazing job. And to take a jab at the TV series while doing it? Masterful! Bit of a cop-out this one, since Sean did both the art and writing for White Knight, but I can’t not give him the title of best artist for his amazingly detailed work over this instant classic Batman Elseworld tale. Murphy has always had a uniquely hard-edged style to his artwork, a style that is matched only by the anarchic genius of his writing. His bold approach creates a great symphony of story and art that sticks in your head and makes you take a second look at well-established characters you thought you knew inside-out. He has a great talent for recreating characters like The Joker, Jim Gordon and Harley Quinn, with a recognizable “animated series” feel to them alongside a damaged look them that gives them a new feel to match their surroundings. Murphy also deserves credit for creating an absolutely striking version of Gotham City, and from the mechanical pistons of the Batmobile right down to the individual window panes of each gothic apartment building there is not a single detail amiss in any of the issues. Moments like Jack’s transition back to The Joker or his moments with Harley hit me right in the heart while the action scenes like the showdown with a squadron of Batmobiles across a frozen Gotham somehow managed to get it beating again. 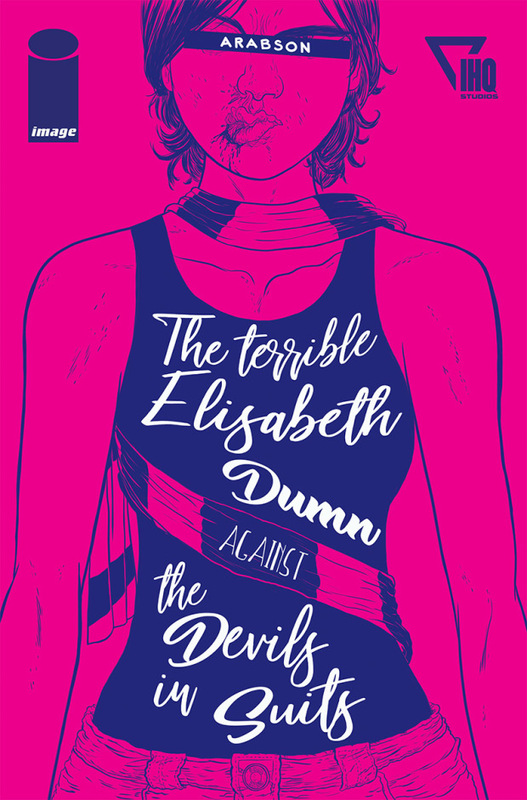 THE TERRIBLE ELIZABETH DUMN AGAINST THE DEVILS IN SUITS (IMAGE COMICS) – A firecracker of a one-shot write and drawn by Arabson and adapted by James Robinson, this tale felt like it was plucked straight out of American folklore or a Tom Waits song. It asks the question about what happens when the devil comes to collect his due but the soul’s current owner does a runner. A seriously enjoyable mix of haggardly-drawn characters, all firmly established in a short enough time to fit some violent fight scenes, devilish ultimatums and dysfunctional family dramas. This stuck out to me instantly as the most unique release I’d read this year, something really different to anything else I’d read before or since. I urge you to give it a read if you’re a fan of Preacher or anything magically macabre. 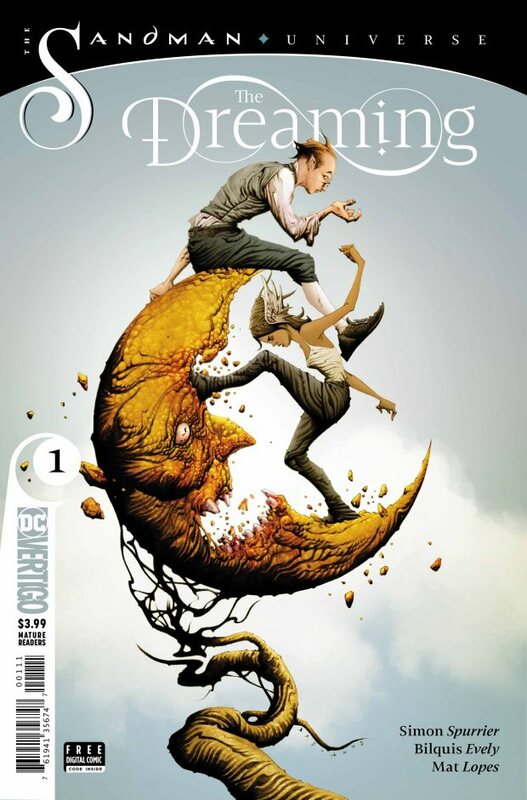 THE DREAMING (DC VERTIGO) – This nearly took the top spot for both writing and art for me. I’ve always had a soft spot for Sandman, enjoying a good binge after spending my student loan on the first few volumes back in the first year of Uni. As such, the characters have always felt like close friends to me, and seeing them so faithfully depicted over this current run has been so enjoyable. The story is a great catch-up with the unique world of the Dreaming. Simon Spurrier has written a tale that picks up where we left them with Daniel the new Dream Lord, more like his dad then we thought, having buggered off and left others to pick up the pieces. As the world literally falls apart we catch up with faces old and new, all running around trying to either keep it together or take advantage of the situation, and all wonderfully depicted with Bilquis Evely’s delicate hand popping in more than one Bowie reference in there to make me smile. Truly beautiful. SHERLOCK HOLMES & THE VANISHING MAN (DYNAMITE) – Holmes stories are a funny thing nowadays. You either have the enjoyable but not massively stimulating Hollywood treatment of Robert Downey Jr and Sherlock, or faithfully updated reinterpretations like Elementary. It’s not often you get a true homage to the original Strand stories whilst still creating a new story with that same feel of Conan Doyle . Leah Moore and John Reppion smashed it out of the park for us Shirley fans, creating a quintessentially Victorian mystery spread over issues that had the same feel of the original short stories in the Strand magazine more than a century ago. 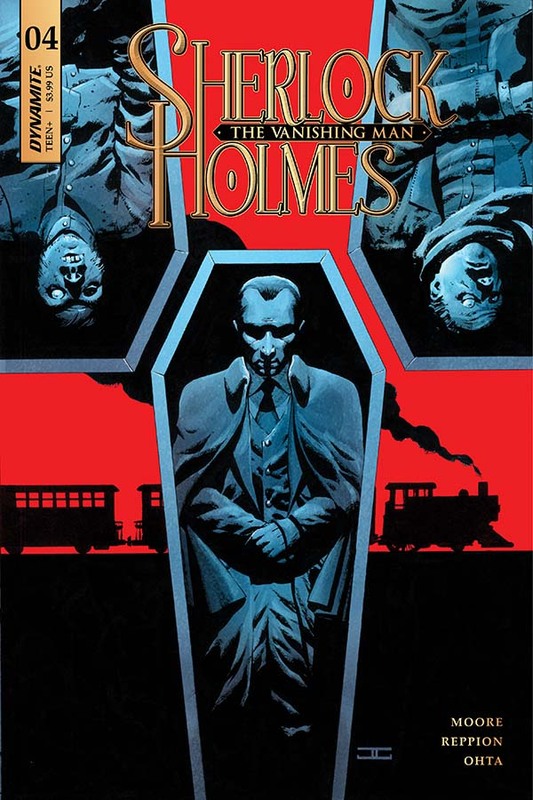 The narrative style and buildup of this new case fits right at home with the established canon, as does the colourful style of the art, both coming together to give an action packed and perfectly pitched Holmes tale. 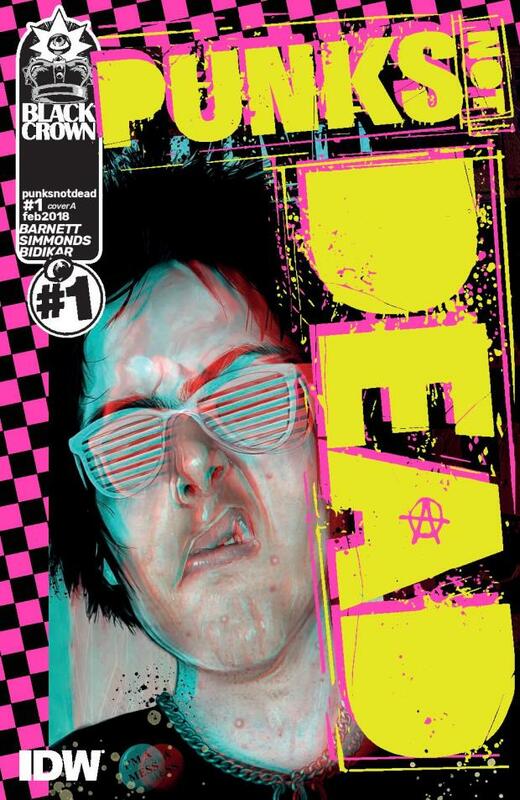 PUNKS NOT DEAD (IDW PUBLISHING) – In terms of things that you really don’t want to get me started on – alongside the occult, politics or obscure Rik Mayal quotes – punk music is right at the top of the list. Trust me, you’ll be there for hours and it’s ruined more than one date for me in the past. But anyway… when I saw that there was a comic that had not one, not two, but three of my passions in one story then I knew I was in for a treat. And how right I was! Punks Not Dead is a supernatural “what if?” tale of adolescence and self-discovery. A young lad stumbles on the ghost of Sid Vicious trapped in Heathrow airport, for some reason the two become bound together and Sid, in his own debaucherous fashion, takes the boy under his wing in the hope of finally moving on to the other side. Unfortunately, an uprising of the dead and other evil forces is happening and poor Sid and his new mate seem to be at the centre of it. I went in hopeful but trepidatious for a story about Sid. I didn’t want them to glorify his bad decisions like Sid and Nancy or use him to plug the story, but thankfully I was gifted with a heartfelt rendition of Sid coming to terms with his life in a well-researched and genuinely moving way, while at the same time reading one of the most batshit crazy, colourful to the point of checking my drink wasn’t spiked, bloody hilarious tales I’ve ever read. 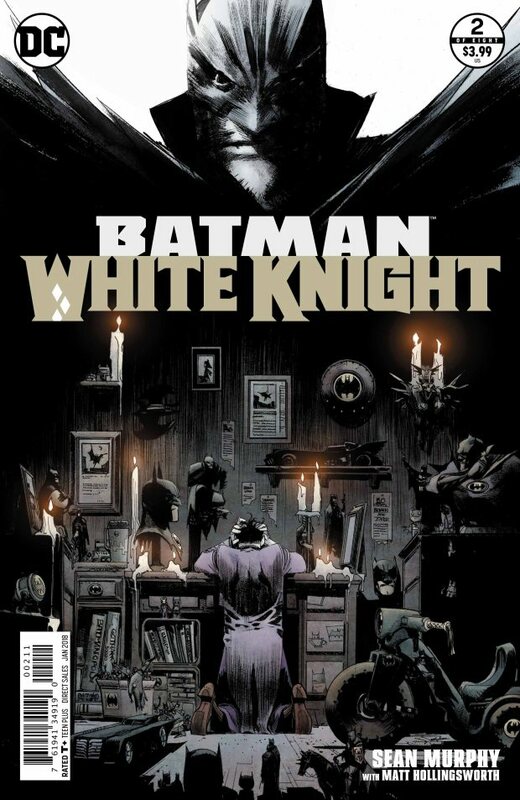 BATMAN: THE WHITE KNIGHT (DC COMICS) – Even though I’ve already sung its praises I honestly cannot say enough just how amazing the journey was reading this masterpiece. It’s got everything a Batman fan could ever dream of; callbacks to pretty much every Bat-film ever made as well as a heavy influence from comic and animated series arcs. But in spite of all these influences, it still manages to deliver something new and utterly incredible in its addition/alteration to these established characters. The changes were at times bold but always delicate and perfectly in fitting with the tone of this new universe. Sean Murphy has delivered yet another insight into the warped minds of the light and dark side of Gotham City, all playing out in a mix of romance, crime drama and action scenes straight out of a Nolan film. A stunning piece of literature and art.